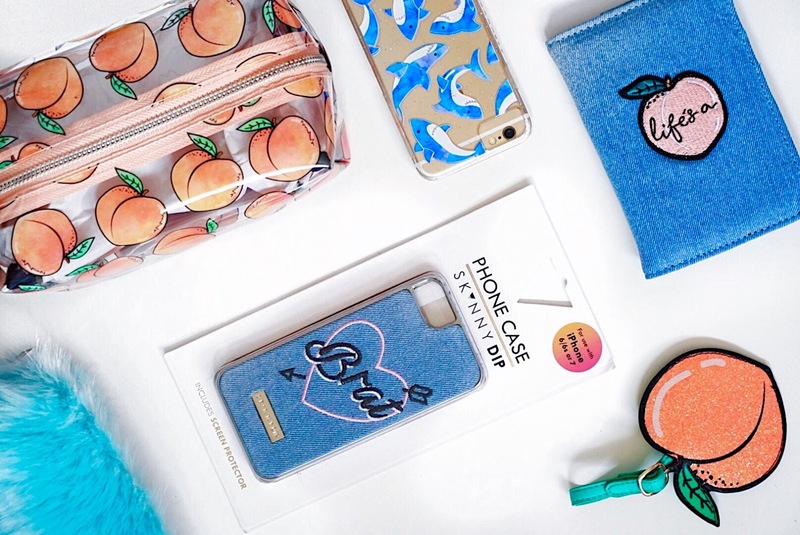 It's no secret that their phonecases are probably their best sellers. Their designs are always so different and are of such high quality. I picked up two, the first being the 'Jaws' case which is the one I currently have on my phone. How adorable are these little holographic sharks?! The second being this 'Brat' case. I honestly jut bought this because I thought it was funny. I'm a little worried about the longevity of this case as it is denim so fingers crossed it doesn't get too scruffy over time. Now onto some travel accessories. Since my trip to France last year I've been struggling to find a cute luggage set for what seems like forever, but I finally found one. A peach themed passport holder and luggage tag! The passport holder has the words 'Life's a peach' on it which is cute, but I love the fact the holder is denim because it reminds me of jeans, peaches and jeans.. you see where I'm going with this? The glittery peach luggage tag goes perfectly with this too so I can't wait to get some use out of these this year! And finally, two makeup bags that I really did not need (anyone else have a ridiculous amount of makeup bags for some reason?). Fitting in with the previous theme, this clear peach bag seemed great for travelling. The material would be super easy to clean if there happens to be any spillages, and it's pretty soft so has a good stretch in it. The mint furry one is more of my every day bag which is just big enough to fit your essentials. Which of the above is your favourite Skinnydip product? omg I love all of these things! 😻 that peach make up bad though is so cute!! I love SkinnyDip- they are such an unusual quirky brand! I am in love with those makeup bags and your photos are incredible! That shark phone case is so cute! I've always been put off Skinny Dip since I got one of their floaty glitter cases and it started to leak, there wasn't any sign of leaking except for the vile smell! It was horrible! Although this wouldn't happen with a normal case! All too cute! Love it!